AFC Fylde striker Danny Rowe believes his side can put pressure on the National League’s top clubs next season. The Coasters were crowned champions of the National League North last month and look forward to a first season in the top tier of non-league football. While admitting it will be a big step up for his side, 50-goal man Rowe insists the Coasters will not settle for simply ‘staying up’. Rowe said: “Of course next season will be a step up but I see that as a positive because players have to step up too. It is a much tougher league with bigger clubs and bigger budgets. It will be completely different to what we are used to. “I’m not sure exactly what to expect or what our realistic expectations should be. It still depends on the kind of signings we make over the summer. “However, the club is going in the right direction and I have no doubt that the aim will be to finish as high as possible and try to put pressure on the play-off places. “I’m not saying we are going to go and win the league but we aren’t going up to just stay up. We want to have a go and see what happens. 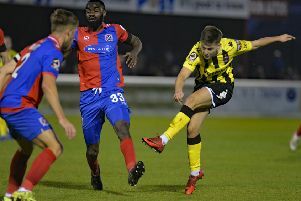 Rowe has dipped his toes into the waters of the National League in the past with Stockport County, Barrow and current champions Lincoln City and believes the Coasters are well placed to succeed. He said: “Compared with when I was at National League clubs in the past, Fylde, in my opinion, are better prepared for this league. There is a better chance of going up than I ever had with Lincoln, Barrow or Stockport at the time. “On a personal level, I’m a far better player now than when I last played at this level. I’m the focal point of the team now through the middle. In the past at other clubs I have played in a two, out wide or in the hole. I think I’m better prepared for the league now than I was back then. “My personal targets are the same every year. Whatever level I played at, I always set the same targets. “The league is tough but two of the best three sides went up which gets rid of a couple of potential challengers.